Royalty-free stock illustration of a man wearing a yellow raincoat with a hoodie on to protect himself from rain. Royalty-free stock illustration of a man wearing a tie, a trench coat and boots while holding a closed umbrella. 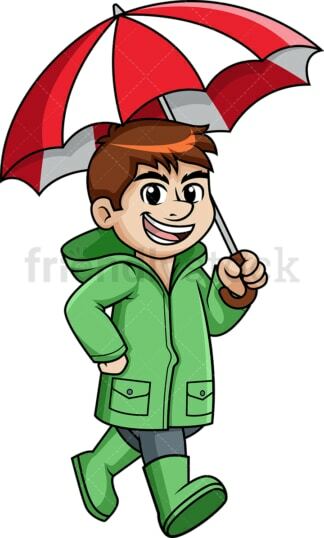 Royalty-free stock illustration of a man wearing a green raincoat and smiling while walking in the rain, holding an open red and white umbrella. 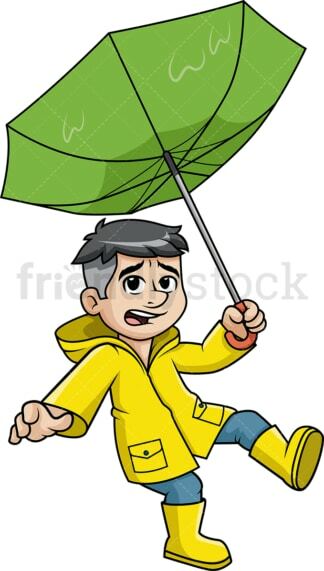 Royalty-free stock illustration of a man wearing a yellow raincoat and trying to hold his umbrella against the strong wind. The umbrella is inverted, turned inside out, and the man looks like he is being blown away by the storm, almost losing his balance. 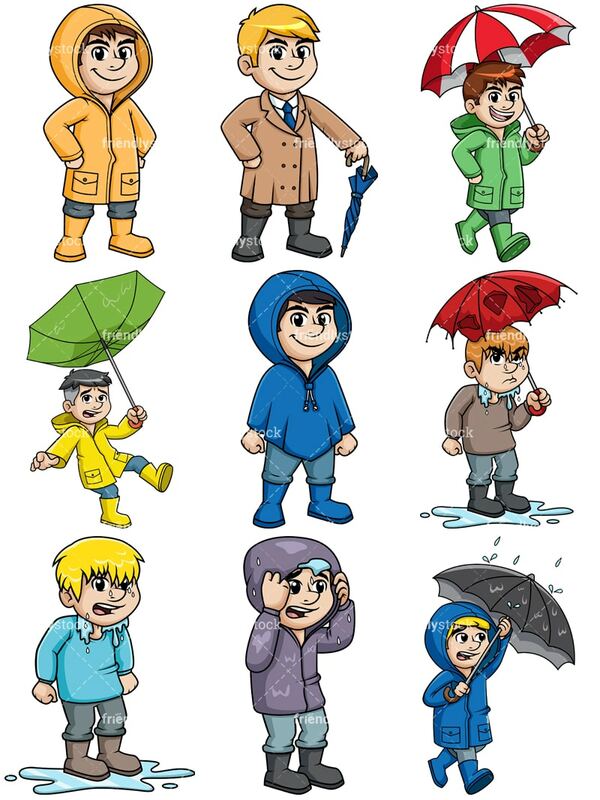 Royalty-free stock illustration of a smiling man dressed for rain, wearing a blue waterproof poncho with a hoodie, long pants and boots. Royalty-free stock illustration of a man standing in a small pond of water, looking all wet and grumpy because his umbrella broke from the wind and the heavy rain. Royalty-free stock illustration of a man who got all wet by standing in the rain without an umbrella. 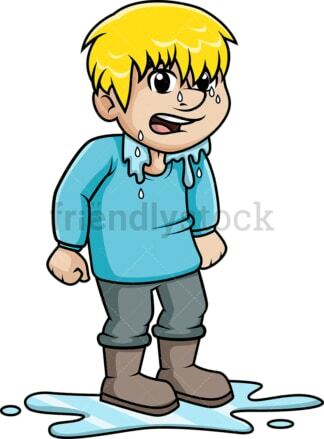 He is looking helpless as he stands in a small pond of water. 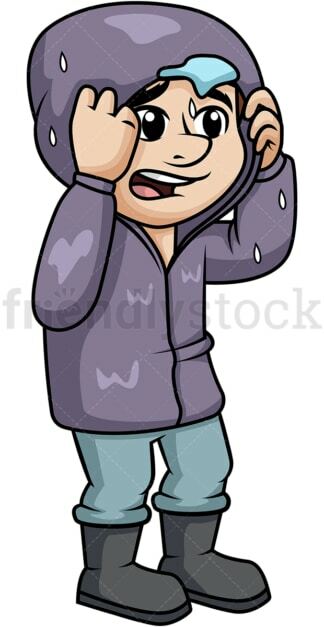 Royalty-free stock illustration of a man putting the hoodie of his jacket on to shield himself against the rain that is starting to drop. Royalty-free stock illustration of a man in a blue raincoat, walking in the rain while holding an umbrella against the wind and the rain that is coming from the side, looking a little worried.